I scan my list… Do I have everything? What if I forget something? I swallow the lump that is growing in my throat. My heart starts to beat faster. I glance down at my watch… Should I leave now? Or do I have more time? If you have been hanging out with me here at 7 Days Time for a while, you have figured out that I am something of a worrywart. Honestly, it is super annoying and exhausting. Fortunately, God has used 2012 (and a majority of my adult life) to slowly but surely start weaning me from worrying. But he’s not done yet. I’ve always heard that worry is like a rocking chair– it gives you something to do, but gets you nowhere. (Can I get an amen?!?!) And let’s not forget to mention that worrying is a sin… Every time we let our mind/heart melt into that puddle of anxiety, it is like we are saying that God isn’t enough and we don’t REALLY trust His plan for us. But here’s the awesome and encouraging news: We don’t have to go alone. God has given us tools and community to combat this issue in our life. If you are a worrier, know a worrier, have been a worrier, worry that you might become a worrier (ha!) or anything of the sort, I invite you to come on a journey– a journey to calm our anxious hearts. I don’t know about you… but I could definitely use a makeover. Starting September 9, my friend/boss/mentor Kelli Wommack and I will be offering a bible study called “Calm My Anxious Heart” by Linda Dillow on Sunday nights from 5 – 6:30 pm at Christ Community Church in Columbus, GA for those of you who are local and can attend. For those of you who aren’t local (which I know is a majority of my audience,) beginning September 10, we will be offering this study via online right here at 7 Days Time and on Facebook! WHOOT! Cool, huh? So whether you are local or in South America, you can participate! We are super excited about this and will be giving more details very soon. So if you are interested in either the Sunday night study or the online study, please let me know by leaving a comment below. Oh, and please share this with your friends if you think they might be interested! I have a sneaky suspicion that this could change ALL of our lives. I’m not even kidding. I’m stoked. And hope you are too! It’s time my friends… Time to say “So long, anxious heart.” Who’s with me? I believe I signed up with Kelli but I want to take the online study perhaps coming on Sunday nights too. You know I’m in! So excited! YAY! It’s gonna be great… for all parties involved, no doubt. So glad to have you along for this journey! Ok Sharita. I’m an eternal worrier, so this sounds like something I need! Sign me up. I have to be in!! I AM A WORRIER, ALWAYS BEEN A WORRIER, AND…. DONT WANT TO BE A WORRIER!!!! This is EXACTLY what I need! Cant wait for more details! Right there with ya, sista! Pumped for you to join us! As usual, I see you are always up to good using your charm and tenacity. I would love to know more about your online class. That’s so challenging, Jenny– and I definitely feel ya. I’ve been a worrier since I was a kid. I’m already praying for God to use this study as a transformational experience and am hopeful that this helps all of us continue on the path to trust Him and kiss our worries goodbye! PS: Thanks for the incredibly kind words and encouragement. They blessed me! 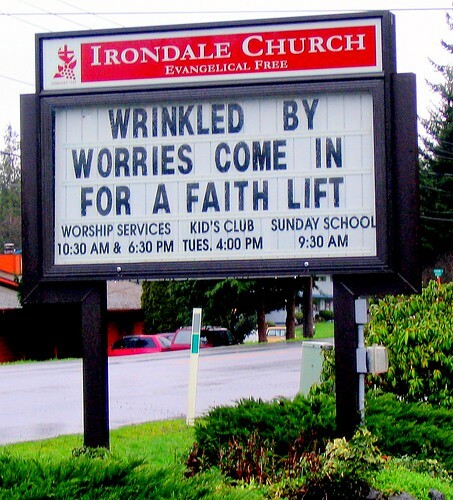 I’m workin’ on a Faith Lift right now … thanks for your words (o: God knew I needed those words today …. Fun. Transformational. Profound. I have a feeling God will be using all of those descriptors! Any level of participation is welcome my friend, so I’m looking forward to your pop-bys! Oh my Sharita i so need this! I struggle with this daily. Please sign me up for the online class. Your blog is such an inspiration to me and i look forward to reading it daily! Thanks so much, Tammy– and consider yourself “signed up!” Watch for a Facebook invite soon and more details on here as well. Oh friend, what a blessing you are to all of us. I am so excited for this opportunity for you and for all of us. I want to join the online study, please. Will it be via this blog and FB or an e-mail kind of thing? Thanks Kayla– I am so happy to have you join us. And as far as your question– it is going to be both via this blog, Kelli’s blog (you can tune into one, either, both or neither) as well as a closed Facebook group for prayer/discussion/homework etc. Looking forward to growing with you in this! Defiantly interested!! Wish I could be there in person but online will be second best. I wish you could be here in person too (or me be there in KS in person!) but I’m looking forward to growing and transforming together online! That study is one of my VERY favorite of all time! Such great info and I keep Ella Spee’s tips on an index card at my desk. This book is something to keep on the shelf and read every couple of years to recalibrate. Good for you, Sharita! Prayers and blessings to you and Kelli as you lead this group. Can’t wait for God to transform some hearts and souls. Hugs back atcha from Georgia! Your husband is a jewel. Thanks, Hazel– and yes, he is a jewel– God really blessed me with him! I would love to be a part of the online bible study! Consider yourself included in our study party!! Excited to “hang” with you, Michelle!